This is a little late, but two weeks ago I stopped by the newly-relocated Fenton Street Market, which moved to Veterans Plaza October 23. Though the outdoor flea market won't return until next spring, its success at Fenton Street and Ellsworth Drive in the center of downtown Silver Spring bodes well for the future. 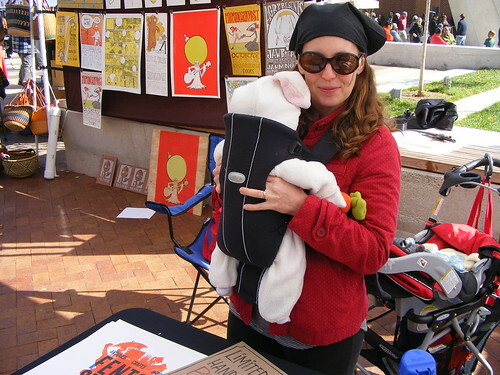 Local resident Hannah McCann (pictured with her newborn daughter at the market, both in Halloween costume) started Fenton Street Market last fall after approaching a local landowner about using an empty parking lot in Fenton Village around the corner from her house. After Ulysses Glee, who owns the lot at Fenton Street and Silver Spring Avenue, released plans to build condos and a hotel on the property, McCann was left looking for a new site. She worked with the Downtown Silver Spring complex, which runs a farmers' market on Ellsworth Drive, and the Silver Spring Regional Services Center, which is located in the Civic Building adjacent to the plaza, to move the market five blocks away. Already, the newly moved market is attracting people. When I visited Veterans Plaza in the early afternoon, shoppers and looky-loos alike were milling around, looking at the several dozen vendors participating in the market and enjoying the scene. With multiple levels, several distinct spaces and a nice canopy, the plaza lends itself well to outdoor shopping. Though the same number of vendors are located in Veterans Plaza as there were in the parking lot, the market feels much more substantial. 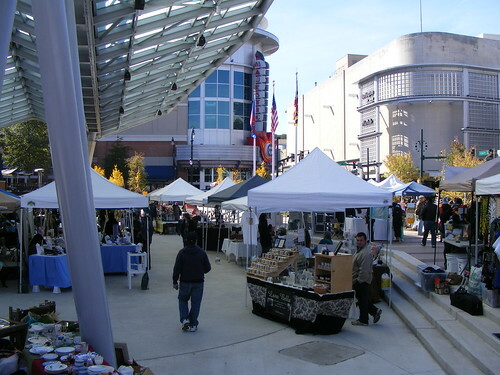 Looking at tents under in the covered area (which will become an ice skating rink during the winter) makes me wonder what it would be like if downtown Silver Spring had an enclosed market hall like Eastern Market. 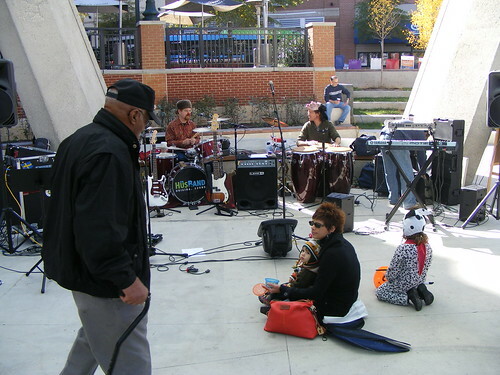 The canopy's also great for concerts, as we've seen earlier this year at events like the summer concert series and the Silver Spring Jazz Festival. 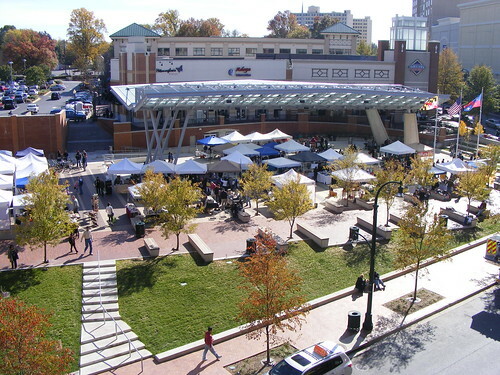 Veterans Plaza tends to be busiest in the evenings, when people stop in on their way to dinner or a movie in downtown Silver Spring. Moving Fenton Street Market to the space will help activate it during the day, drawing visitors to the area and hopefully drumming up more sales for local businesses. While I've been thoroughly disappointed by previous attempts to program Veterans Plaza in the past, I'm excited about the arrival of Fenton Street Market and I hope they're around for a long time. The thing about Eastern Market is that most of the vendors are outside. The only (very few) vendors inside are selling meats, fish, and baked goods. 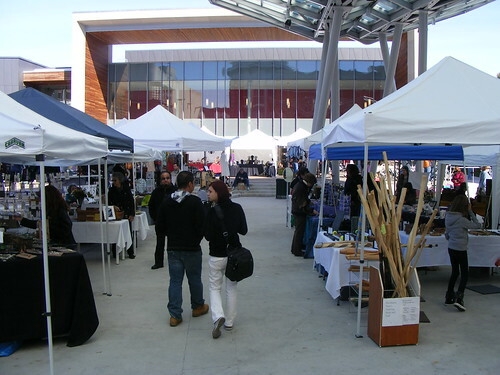 Outside is where you'll find the produce, hand-made arts, jewelry, paintings, photos, and flea market. Outside is where it's at. Awesome new location and the old location will be a great mixed-use new build. Talk about win-win.